Digital Agriculture encompasses a wide variety of data collections that farmers, companies, and government agencies utilize to aid in decision making related to crop production and farm management. Farm data can be used to predict potential yield changes from prescribed inputs and help improve efficiency of farm operations. By using farm data to drive input management and other farm decisions, farmers can identify and quantify which productivity variables are limiting production or profit and make adjustments. As agriculture becomes increasingly digital and mobile via increasing use of consumer devices (smartphones, tablets, etc. ), it is important to understand how data is being collected, interpreted, and utilized. This digital agriculture concept can be overwhelming, and the purpose of this publication is to inform farmers about data principles like data ownership. In order to keep Ag Technology Providers (ATPs), input suppliers, local retailers, and other agribusinesses from abusing the responsibility of using farm data, the American Farm Bureau, along with a broad cross section of agribusinesses and other groups, drafted a set of guiding principles for the agriculture industry. In 2015, a group of 34 organizations (currently up to 37), representing these companies developed 13 principles that address challenges and concerns that farmers have around data ownership and digital agriculture. These farmer-oriented principles provide safety, usability, and transparency guidelines to Ag Technology Providers. Outlined in the policy titled Privacy and Security Principles for Farm Data, these principles are explained to allow farmers to make educated choices about how their data is handled. The first principle outlined by Privacy and Security Principles for Farm Data states that: “Grower education is valuable to ensure clarity between all parties and stakeholders.” Farmers have a responsibility to be knowledgeable about the data collection processes on their farms. Many resources are available to farmers on this topic; including the Ohio State Precision Ag website (go.osu.edu/precisionag_bigdata), which addresses some current concerns surrounding Big Data usage, along with common terms and definitions used in the industry. Questions are key to understanding how prescriptive agriculture services can bring value to your farm and full advantage should be taken of the ATPs’ customer support, extension resources, and other avenues of knowledge about Digital Agriculture. Some degree of self-research is required to understand the aspects of data usage, access, sharing, privacy, and security. An open-line of communication is key to a quality relationship with ATPs. If confusion still exists about how data is shared and analyzed, farmers need to ask for clarification! When choosing an ATP, farmers should ensure their privacy policies and consent agreements align with the Privacy and Security Principles for Farm Data Policy. Education on the topic of Big Data is vital to your farm operation. With the ever-growing integration of digital agriculture into current technology, data sharing and prescriptive agriculture likely will be necessary to stay competitive. While there is major potential for profit in the management of farm data, problems occur when trying to determine who owns the data and how it can be used for some other benefit. The ownership principle states: “We believe farmers own information generated on their farming operation. However, it is the responsibility of the farmer to agree upon data use and sharing with other stakeholders that have an economic interest.” It is left up to the farmer to ensure that only data they own or have permission to use is included in the ATP account. It is important for farmers to think about how their data can be used and controlled. Between landowners, tenants, and commercial applicators, many scenarios exist where ownership of produced data may be unclear. The companies who agreed to the Privacy and Security Principles for Farm Data document realize how these various scenarios affect farming operations across the country. By making sure that contracts, leases and agreements are explicit, farmers can have a clear understanding of who owns which data; ownership designates control. Ownership implies both control and responsibility. Common aspects of many ag data agreements include sharing and aggregation of data. Most agreements will incorporate aspects of data collection, access, and control into contract language. When reviewing these agreements, farmers must think about the long-term effects entering into these agreements. Fully understanding collection, access, and control requires heavy emphasis on education. It is imperative when farmers are signing contracts (pen and ink or digital), that they clearly understand what they are consenting to. Who, or what entity, has the right to collect, access, and control farm data are all components that should be explicitly stated in contract agreements between farmers and ATPs. If at any point a farmer is unsure of how data will be utilized, they should clarify with the company requiring the contractual agreement. A key component to any ATP contract agreement is the specifications of how and when data is being collected, and how and for what the data will be used and who has access to it. The notice for the addition of data, or manipulation of existing data should be clearly expressed to farmers in contract agreements. This notice can come in the form of an explicit statement, page, or separate document and should be very clear but specific. Today, many apps utilize a special pop-up window requiring the user to acknowledge how the app can use data. A good practice is providing a similar notice to farmers when signing data contracts with ATPs. The notice should contain clear and transparent verbiage so that no question is left about how data is being used and by whom. Principle 5 outlines the style and scope of the contracts that the ATPs provide to farmers. This principle requires that contracts are written in a clear, concise, and consistent manner. Within the contract that ATPs provide to farmers, there should be an explicit statement that tells the farmer exactly why their data is being collected, and exactly who has access. Information should be clearly noted, listing contract information should farmers have questions or concerns. Additionally, this principle outlines that an ATP cannot change anything in the farmer’s contract without their permission. If there is a dispute, various legal principles can aide in a negotiation process to create a contract that satisfies both parties. Farmers need to remember, they have choices of whether or not to enter contracts with ATPs and those choices should be based on transparency and consistency within the contracts presented to them. Most data management services offer various levels of service, or “add-in” packages that can be purchased for an additional fee. The choice principle describes the ability to choose which level of service is right for you. According to the Privacy and Security Principles for Farm Data, “farmers should be able to choose some, all, or none of the options offered.” It is important for farmers to select an ATP who offers explanations regarding a farmer’s choice to opt in, opt out, or disable any services that they offer. Occasionally, multiple data processes are offered within individual programs. Trusted ATPs should ensure that all options and processes are disclosed and clearly explained within the contract agreements. Farmers will then be able to make an educated decision about their choice of services, variations enabled, or add-ins. Data portability is a critical principle that farmers must understand in order to capitalize on farm data profit potential. Today, some farmers are sharing data with up to three trusted advisors and the potential to share with eight or more advisors is coming in the near future. This exchange of data is necessary in order to receive information and recommendations at a field specific level. Ultimately, farmers need to have the flexibility to share data with whomever they please. Therefore, data portability or simply the ability for farmers to reuse their data across interoperable applications is important to maximize options, benefit, and value. This principle ensures that farmers have the ability to use their data in the way that they best see fit. Data portability is necessary for the farm in order to have maximum opportunity for utilizing your farm data. Without portability, retrieval and sharing of your data can be burdensome, minimizing the ability to obtain information or recommendations, and maximizing per acre profitability from multiple data service providers. When selecting a data service, understanding “Terms and Definitions” becomes an important component of the decision. To date, terminology has not been developed for much of the digital agriculture industry. However, contracts and privacy statements are required by this principle to be clear and concise in the verbiage used for farmer contracts. In the agriculture industry, terminology can change from one company to the next, leaving the consumer to dissect the true meaning behind these terms. For example, between two companies, the act of a planter NOT dropping a seed into place could be referred to as “skip” or a “miss,” but both can be interchangeable as related to planting. Due to the ambiguity surrounding this industry, it is extremely important that all participants within a data contract have a clear understanding of what they are agreeing to in these contracts. Knowing specific terms and their accompanying definitions allows for contracts to be clear, concise, and better understood among all participating parties. According to the Privacy and Security Principles for Farm Data, “An ATP will not share or disclose original farm data with a third party in any manner that is inconsistent with the contract with the farmer.” ATPs should make sure farmers understand how any data is shared or possibly sold to a third party. Further, it is important to have legal contracts relating to not only the ATP data relationship but contracts with other entities that provide data services (or access) as well. Farmer surveys show this need of full disclosure and the ability to understand contracts is one of their primary concerns. While some growers are comfortable with their farm data being aggregated and used as a marketing tool, others are not. Farmers should be given the protection and choice about how their data is being used and sold to third party data aggregators. Data retention policies represent a clear and concise set of guidelines that outline how data will be archived, how long it will be kept, and how it will be removed or returned to the farmer. Privacy and Security Principles for Farm Data delegates in this principle that farmers need to understand how long data will remain in an ATP’s system. Also, if a farmer requests that their data is removed, will their data be destroyed? The request process to retrieve and remove data from a system should be noted in a contract with an ATP. Farmers, who wish to have access to their data at all times, must understand the exact availability options provided by their ATP. Farmers need to be assured that their personally identifiable information (PII) is protected and that data is being properly destroyed to limit leaks of protected and confidential data. Of note, GPS tagged or georeferenced data could be considered personally identifiable information. Farmers should take the time to read portions of contracts specific to termination to determine what it means to them as a user, and also what it will mean for the company or agency upon cancellation. By being proactive and asking questions about contract termination, farmers can maintain a good relationship with their ATPs. Contracts between farmers and their ATP’s should clearly outline the provisions for cancelling a contract. The ability to opt out of a contract is imperative along with knowing what happens to the data once a contract is terminated. Additionally, the ATP may break the contract for the producer not providing “all” of the data or not actively using a digital tool. If a farmer is unhappy at any time with the services, features, or other components of their contract(s) with an ATP, and assuming all ongoing obligations are being considered, they should be able to terminate the contract. A common concern for farmers when working with an ATP is that the ATP — to benefit the company — may use their data in the marketplace. Principle 12 of the Privacy and Security Principles for Farm Data states: “ATPs should not use the data for unlawful or anti-competitive activities, such as a prohibition on the use of farm data by the ATP to speculate in commodity markets.” Within the agreement or in the terms and conditions between a farmer and their ATP(s), there should be an explicit statement regarding the prohibition of anti-competitive activities. If the contract does not specifically mention these unlawful or anti-competitive activities, farmers should be on guard for wording that could disguise these types of actions. By being knowledgeable about what activities constitute unlawful or anti-competitive behavior, farmers can be better prepared when entering into contract agreements with an ATP. In today’s world, most individuals have electronic data stored on multiple devices and in various locations. Most generated farm data is stored by a technology provider in a cloud or an off-site location. While no set of security measures is completely infallible to a breach, security breaches have become a source for concern or doubt among producers who store their data in these off-site venues. In recent years, security breaches of data in multiple industries have occurred at large name companies causing consumers to be on edge even more when it comes to protecting their personal information. This principle holds ATPs to a high standard of security when it comes to storing your data. Additionally, it states that the ATP should notify farmers in the event of a breach. Within the contract, ATPs should be clear and concise when outlining these data protections. More so than ever, growers need to be aware of how their data is being used by ATPs and other businesses. Producers need to be informed. Understanding digital agriculture is the first step in being a good data steward and making better informed decisions. In 2016 the agriculture technology sector was worth $3.2 billion (courtesy of AgFunder) up from the $2.4 billion value of 2014. While some levels of skepticism and mistrust remain at the grassroots level, the fact is, good farm data management can provide profitability for farmers and others in agriculture. Ask questions before sharing data or signing up for a service. Do not ignore the mountain of real-time data being generated that you can collect today. It can provide numerous opportunities. Commit to learn more about data. Understand that, as a farmer, you should retain a personal copy of your Precision Ag data and, at minimum, organize by year. Finally, commit to improvement by using data to be more competitive. Use data as an asset to improve profitability! While many concerns and issues with data utilization in agriculture may arise, Big Data and prescriptive agriculture is here to stay. Remaining competitive will require farms to fully understand the contracts and relationships. The authors thank all reviewers and the time they took to provide constructive feedback. This fact sheet was reviewed by Dr. Elizabeth Hawkins, PhD, Assistant Professor and Field Specialist, Ohio State University Extension; Dr. Ajay Shah, PhD, Assistant Professor, Department of Food, Agricultural and Biological Engineering, The Ohio State University; Dr. Bruce Erickson, PhD, Agronomy Education Distance and Outreach Director, Department of Agronomy, Purdue University; Rory Lewandowski, Wayne County Extension Educator, Ag and Natural Resources, Ohio State University Extension; John Barker, Knox County Extension Educator, Ag and Natural Resources, Ohio State University Extension; Don Bierman, Chief Executive Officer, Crop IMS. 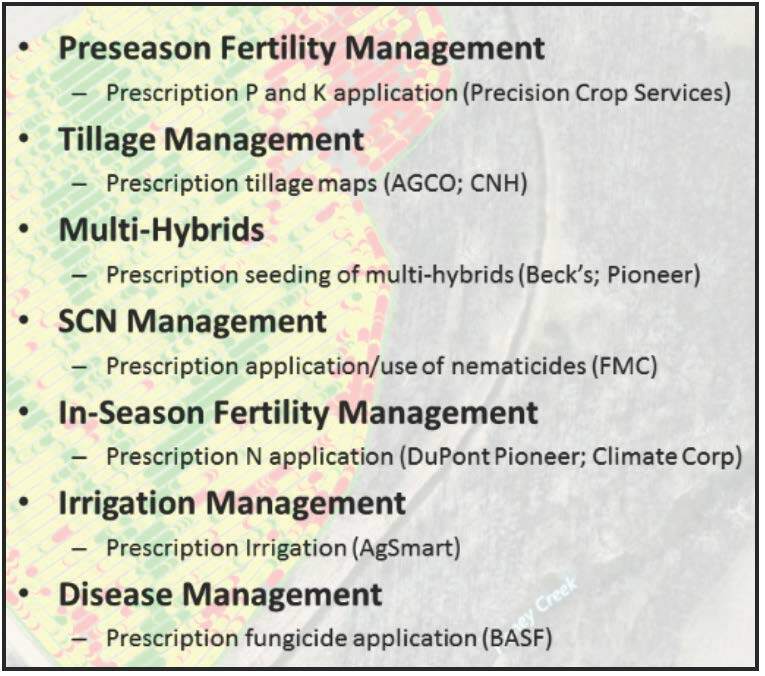 Visit the Precision Agriculture website (ohiostateprecisionag.com) for additional Precision Ag information from The Ohio State University College of Food, Agricultural, and Environmental Sciences.